In an ad for Apple Music. Taylor Swift is a noted hip-hop fan. In the past, she has repeatedly voiced her appreciation for Kendrick Lamar, especially his song "Backseat Freestyle." This eventually led the two artists to team up on the "Bad Blood" remix, which became a No. 1 pop hit. 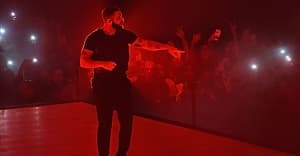 Swift's latest endorsement goes to Drake and Future: as part of a new promo spot for Apple Music, the pop star raps every word to Drake's verse on "Jumpman." The fact that much of the song involves repetition of the title phrase makes Swift's job easier, but she's also rapping while running on a treadmill, which is no easy feat. Watch until the end.